I meant to post at least once a month, but I think you’ll understand that it’s hard to find the time while juggling new freelance science writing work with a 9-month-old kiddo at home. Anyway, here’s a couple pieces I’ve published over the past month. Enjoy! (See links below for the full articles.) As usual, thanks go to my helpful editors: Heather D’Angelo, Lisa Grossman, Lauren Morello and Jane Lee. A giant asteroid or comet the size of a city smashed into the Yucatán 66 million years ago, likely causing the demise of dinosaurs and many other species. Scientists have wondered: is that a random, unfortunate event, or has life on Earth been subjected to periodic impacts from outer space? 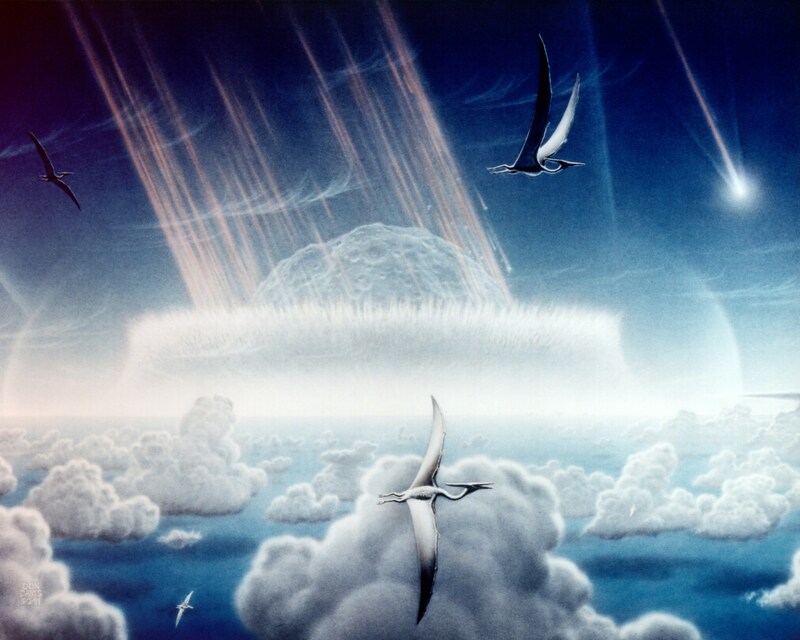 Some researchers proposed that, if the dinosaur extinction — the last of five mass extinctions — had an astronomical origin, rather than being driven by volcano eruptions or global warming, for example, then maybe others did too. And if impacts from huge boulders of rock and ice drove these extinctions, they had to come from somewhere. It’s possible that dark matter could periodically dislodge distant comets from their tenuous orbits beyond Pluto, sending a few of them dangerously in Earth’s direction — thus linking the fates of dark matter and dinosaurs. But a new study by a team of physicists and geologists from Durham University and Lancaster University in the United Kingdom appears to shoot down that dark matter interpretation. If it were true, extinctions would have happened in cycles. But these scientists pored over the fossil record over the past 500 million years, looking for extinctions occurring periodically, but they didn’t find any significant patterns like that in the data. “We needn’t search the heavens to find reasons for these extinction events. The vast majority of them are due to Earth processes, not astronomical ones,” says David Harper, lead author of the study. The dark matter idea, popularized by Lisa Randall’s 2015 book, “Dark Matter and the Dinosaurs,” might sound far-fetched. But before this study, it was more plausible. Our solar system resides in the middle of the Milky Way galaxy, which has a disk-like structure. It turns out that the solar system doesn’t just stay put; gravity pulls it up and down through the disk, like a pendulum. Lurking in the outskirts of the solar system, comets in what’s known as the Oort Cloud slowly orbit the sun, whose gravity barely holds them on their trajectories. A pass through the galaxy does change the gravitational forces on them, but not enough to let comets loose. Instead, Randall speculates that within the same plane as the Milky Way is a much thinner and denser disk of dark matter that we can’t see. (Most astrophysicists think dark matter particles only clump up in sphere-like conglomerations, but one flavor of dark matter could form disks.) Then as the solar system passes through that disk every 32 million years or so, it’s as if the dark matter’s gravity provides a little extra tug, nudging a few comets out of their orbits. While some untethered comets get flung away, never to be seen again, others head toward Earth. Over time, these would produce periodic blips in the Earth’s history of both craters and mass extinctions, which wouldn’t occur randomly. It’s a new incarnation of an older idea, where earlier astronomers suggested the possibility of a faraway solar companion dubbed Nemesis, which would provide the extra nudge, but it was never found. Harper and his colleagues performed something called a time-series analysis, looking for subtle cycles in the data that would corroborate Randall’s hypothesis. After removing a background trend and running statistical tests, they found that the extinctions don’t occur periodically on any time-scale. The risk of finding a pattern when there’s not one really there is enormous, says Michael Benton, an Earth scientist at the University of Bristol in the UK. “The fossil record is patchy, biased, and incomplete,” he says. The structure of our Milky Way makes for another complication. The galaxy looks more like a fluffy pinwheel than a compact disk. It has spiral arms jutting and curving out while neighboring stars in the galaxy move to and fro, so as our solar system passes through the galaxy, its periodic motion will vary. Harper argues that this motion would then be too irregular to pull in more wayward Earthbound comets that result in mass extinctions. Randall agrees that there’s more than one cause to extinctions on Earth. But she argues that if things like volcanic activity, plate tectonics, and climate change can’t explain them all, some may have been triggered by cosmic events. She and her colleagues developed a model of a dark matter disk which she says fits the crater record better than a bunch of random impacts. As it turns out, another new study, unrelated to Harper’s, looks at the record of crater impacts with a similar kind of analysis. They come to the same conclusion: there’s currently no evidence for asteroids or comets periodically colliding with Earth. “I actually like the idea of asteroid impacts. But from the data we have, all I can say is that it’s unlikely,” says Matthias Meier, the lead author and a cosmochemist at Swiss Federal Institute of Technology in Zurich. It would help to have more and better crater data. Meier studied 22 craters, but there are nearly 190 known craters worldwide. Many of them were dated more than 50 years ago with earlier methods and aren’t very precise, but if one limits the sample to only the most accurate crater ages, there may be too few of them. Once scientists discover more craters and estimate more accurate ages of them, they could settle the debate. The red dwarf doesn’t fall far from the tree. Astronomers are borrowing a technique from biology to build a family tree of the origins of stars. A star’s chemical make-up can tell you a lot about where it came from. The universe’s first stars were mostly made of hydrogen and helium, and they fused those elements together into heavier ones. When massive stars explode as supernovae, they disperse the heavier elements they’ve built into space, where they become the building blocks of the next generation of stars. Stars born after many generations have heavier elements in greater abundance than do older ones. “This process of ‘descent’ mirrors that of biological descent, even though biological evolution is driven by adaptation and survival, while chemical evolution is driven by mechanisms that lead to the death and birth of stars,” write Paula Jofré at the University of Cambridge and her colleagues. New analyses cut down the estimated number of planets unattached to a star by half. Most planets live their lives tethered to the star that created them. But some renegade worlds wander across the Milky Way without a host. Two new analyses suggest that Jupiter-sized rogue planets are a lot less common than scientists thought. The Galaxy is likely home to around 100 billion of these planets, one study shows, instead of the 200 billion proposed in 2011. Two teams of researchers presented their findings on 2 February at a conference in Pasadena, California: one based on a recent statistical analysis and the other on observations of more than 2,600 microlensing events. These occur when a planet passes between Earth and a distant star at just the right angle to — temporarily — act like a cosmic magnifying glass. It can briefly brighten the light from the star and provide researchers with information about the size of the ‘lens’, or planet, which might not reflect any light. This technique is currently the only way to spot these giant rogues. Previous estimates of the number of free-floating planets stemmed from a 2011 analysis of ten microlensing events suggestive of renegade worlds1. The authors hypothesized that there could be as many as two rogue worlds for every main-sequence star — one of the most common categories, which includes the Sun. The 2011 finding flew in the face of how many astronomers thought rogue planets formed. In a binary system where each star hosts its own planets, the gravitational force of one of the stars could disrupt the orbit of a planet and fling it out of the system. There could be similar effects in a crowded cluster of stars, where one star could eject its neighbour’s outer planet.